Waves were breaking at 15 to 18 feet Friday morning but built bigger into the afternoon and into the towering surf of 20-to30 foot waves required for the competition. 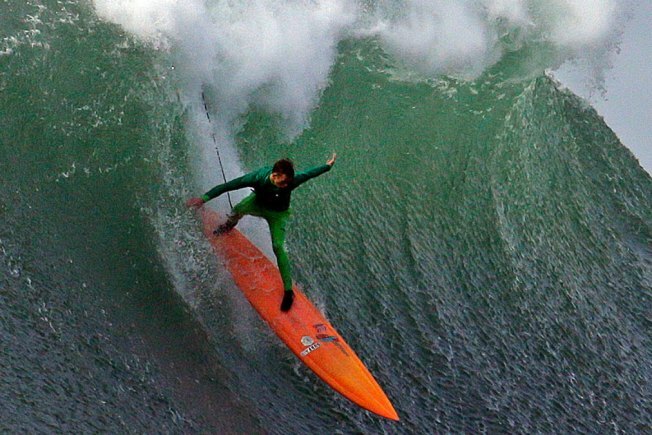 Northern Californian Nic Lamb won the prestigious big-wave surfing contest known as the Titans of Mavericks Friday. 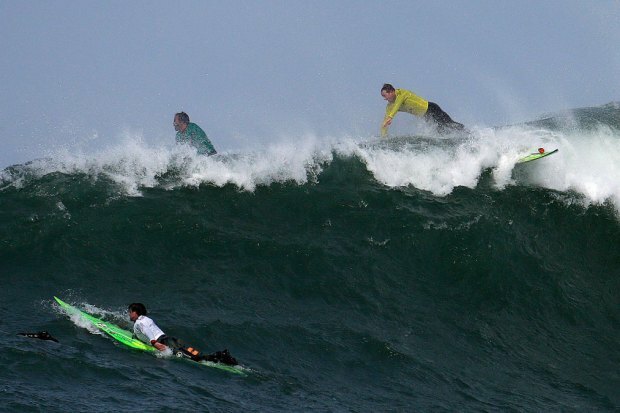 Lamb, 27, outlasted 23 competitors and a big wipeout to capture the 10th championship with a $120,000 purse at the legendary Mavericks surf break at Half Moon Bay, about 20 miles south of San Francisco. "I'm over the moon," Lamb said after climbing aboard a chase boat following the competition on the water. Lamb is from nearby Santa Cruz, which is about 60 miles south of Half Moon Bay, and surfed Mavericks growing up. He now lives in Venice Beach in Los Angeles. The waves weren't as big as past competitions, but grew steadily from 15 feet to 30 feet throughout the afternoon. Several surfers suffered spectacular wipeouts, including one of the pre-contest favorites Ken "Skindog" Collins. Collins, also of Santa Cruz, suffered a punctured ear drum and was forced to withdraw from the competition after a bad spill in the pounding surf. The surf then petered out during the finals and the six remaining surfers had few large waves to ride at the end. Travis Payne of Pacifica, California, finished second and Greg Long of Santa Cruz finished third. Long also won the $10,000 "boldest drop" award for the most spectacular ride of the day. Long won the event in 2009. James Mitchell won $5,000 for the day's best ride in the "barrel." The surfing event is a one-day, invitation-only competition held almost every year when conditions are deemed just right between Nov. 1 and March 31. The event has been canceled four times -- including last year -- since 1999 because of lack of waves. The contest was last held in January 2014. Surfers received the call Tuesday, when many had gathered in Hawaii to participate in another renowned surfing contest. "The Eddie," as it's called, was cancelled hours before it was supposed to take place because of undersized breakers. The swells travel through deep water for days before hitting a section of shallow reef that juts into the sea. When the swell hits the reef, the wave jumps up and crashes back down violently, then washes through craggy rocks. In 2010, the contest attracted more than 100,000 live fans while thousands more watched on big screens at AT&T Park in San Francisco. The live crowd overwhelmed the beach. About a dozen people were injured after a wave knocked spectators into the water. Spectators now have to watch online. This season's invitees are all male, but that could change.